PHPS.kr Review 2019: Is PHPS.kr a Good Hosting? PHPS.kr provides website hosting specifically for PHP developers. The plans use HDD and the support for beginners is presumed to be low, but the pricing is affordable and experts are well catered to. PHPS.kr (a website hosting company) is part of a family of Korean companies, called PICHISKY SCHOOL CO., LTD. The company began in 2002 and includes PHPSchool (developer community in Korea), DiZi (custom website design), and DNSzi (DNS management). It has since grown into the largest community in Korea specifically designed for developers, with a Korean language website. The servers are Linux operating system with Apache web server, however, I’m surprised that HDD is still in use as opposed to the far faster SSD, which is generally being moved towards by most hosting companies. The plans are fairly customizable. Although you can choose from five base plans, you can add or remove resources to build a plan to suit your requirements. Optional add-ons include more HDD storage, more traffic, domains, or email accounts. It’s quite unusual to be able to customize shared hosting plans, so it’s a nice value add. The situation regarding beginners is less clear. There isn’t a one-click installer or a website building tool advertised and unfortunately, I couldn’t get confirmation from customer service, so it’s unclear if there are limited beginner features, or they are just not displayed. The prices are in line with local and international competitors. Certainly not expensive, however, I have seen cheaper given the level of value-added features. You will need to purchase a domain name and an SSL certificate, so make sure to take those costs into consideration. You can buy the plans in one month or one year terms, but there’s no discount for purchasing the latter upfront. When you purchase a plan, you need to sign up for an account first, which although quite usual for Korean companies, is a long process and not user friendly. 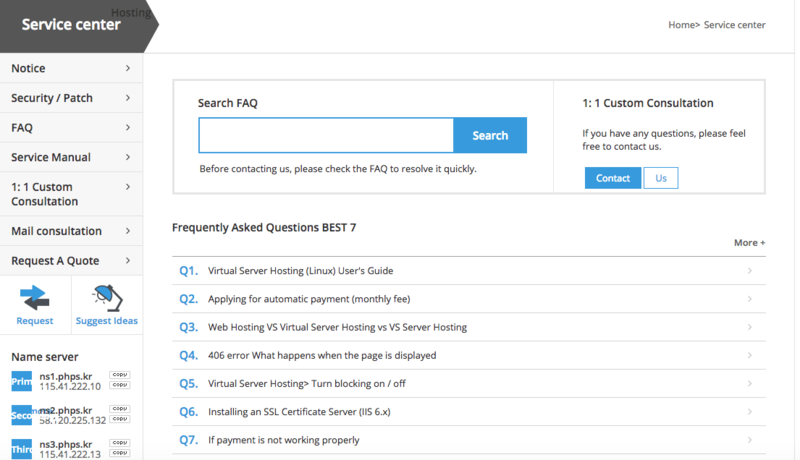 There’s a “Service Center” on the website, which includes a phone number, online contact form, a help manual, and a small number of FAQ articles. The business hours are between 9:30 a.m. and 6:30 p.m., with a lunch break from 12:30 p.m to 1:30 p.m. It mentions night, weekend, and holiday support, although it’s less clear in what form that comes. I sent an email via the online contact form at around 3:00 p.m. on a Tuesday. The form was complicated and took me several attempts to complete, mainly because of the language, so this is likely not a problem for Koreans. Unfortunately, despite waiting several days, I did not receive a response. This is one company in a group of businesses, which claims to be the largest community of developers in Korea. The plans still use outdated HDD and there’s no uptime guarantee to talk about, but the plans are well priced and include all the features a PHP developer would require, with a presumed low level of beginner features. 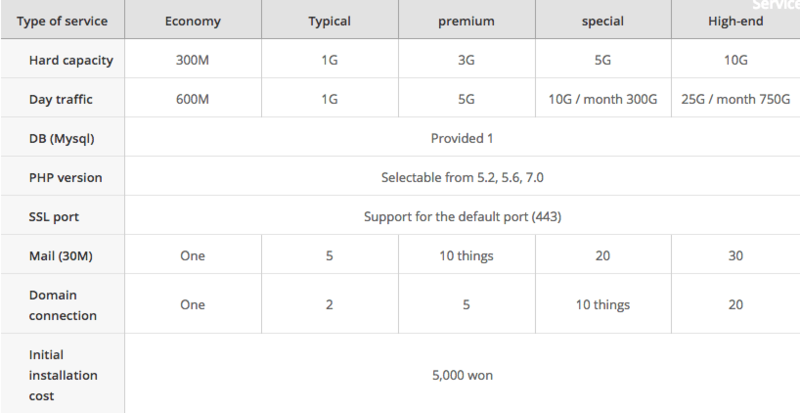 Wondering how PHPS.kr stacks up against other Web Hosting companies? Enter any other Web Hosting company and we will give you a side-by-side comparison.